The Spanish government has ruled out agreeing on an independence referendum with the Catalan government after their first bilateral commission summit in seven years — a meeting marked by great discrepancies between both executives. 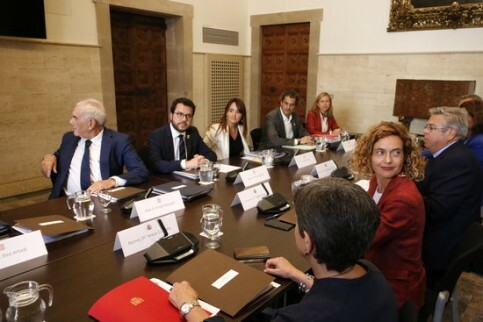 Meritxell Batet, minister for territorial policy and head of the Spanish delegation, said that Catalonia’s right to self-determination “does not exist,” and rejected creating a bilateral working group on the matter. “We’ll insist, and we’ll win even though they keep telling us that this is not a matter for discussion,” said in response Ernest Maragall, Batet’s counterpart in the Catalan delegation and minister for foreign affairs. The summit comes after a year of unprecedented political turmoil, marked by last October’s referendum and declaration of independence, all deemed illegal by Spain. Prime Minister Pedro Sánchez came to power last May after ousting Mariano Rajoy in a motion of no confidence backed by pro-independence parties. With the Socialists in power, both executives resumed dialogue despite major discrepancies. If narrow, there was some margin for agreement too. The Spanish government will consider removing the legal challenges presented by Rajoy’s government against the so-called “social laws” — a series of bills put forward by the Catalan government focused on energy poverty, climate change and universal health, amongst others, and suspended by Spain’s Constitutional Court.